Figure. The linear lesion on the girl’s leg. An 8-year-old girl presents with a six-week history of an erythematous linear lesion on her left thigh (Figure). It is slightly raised and scaly but not itchy. The girl has been previously well and the lesion developed quite suddenly, over a few days, and has persisted despite treatment with mometasone furoate 0.1% cream and miconazole cream. Many skin conditions can manifest as linear lesions. 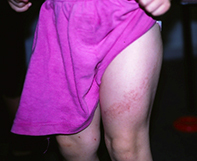 The most likely cause of the sudden onset of such a lesion in an 8-year-old child is lichen striatus, a benign, transient linear eruption that follows the developmental lines of Blaschko (embryonal lines along which the skin develops). Lichen striatus is a self-limiting condition that lasts from a few months to three years and may at times relapse. It is not rare and is much more common in children than adults (the median patient age is 2 years). Lichen striatus is usually erythematous but it may be hypopigmented or hyperpigmented, particularly in children with dark skin. It most commonly occurs on the limbs but can occur anywhere on the skin surface. It is generally asymptomatic. Linear epidermal naevus. This uncommon lesion usually causes the most diagnostic confusion for linear lesions in young children because it is not always obvious at birth and may present for the first time in toddlers. Linear epidermal naevi may be erythematous or hyperpigmented and persist for life. They may be very difficult to differentiate from lichen striatus on clinical grounds; a biopsy will usually differentiate the two conditions. However, it would be most unlikely for an epidermal naevus to appear suddenly in an 8-year-old child. Psoriasis. It is well described that psoriasis can present as a linear lesion. However, this is rare and a patient will often have other signs of psoriasis. Cutaneous larva migrans. This is a cutaneous infestation by the larvae of hookworm, most often acquired from dogs and cats. Children may contract the infestation from sitting in contaminated sand or soil. The migration of the larvae produces a thin, raised linear lesion that often has a vesicle at the advancing edge. Although larva migrans presents as a linear lesion, it is not scaly and usually has a very different appearance to lichen striatus. Darier’s disease. This rare genodermatosis usually presents for the first time in adolescence or young adult life as hyperkeratotic papules on the trunk and limbs associated with nail changes and sometimes blistering. It has been described, rarely, as a linear lesion but would be highly unlikely in an 8-year-old child. There is no effective treatment for lichen striatus. The condition is harmless and self-limiting, so reassurance is all that is usually needed. 1. Patrizi A, Neri I, Fiorentini C, Bonci A, Ricci G. Lichen striatus: clinical and laboratory features of 115 children. Pediatr Dermatol 2004; 21: 197-204.